PC gaming is alive and well. If you declared this online just a few years ago, your audience probably would’ve laughed. But today, if you say PC gaming is thriving, people would certainly agree. One of the factors that can be attributed to the platform’s resurging popularity is indie games, specifically early access: a funding model where you pay for admission to play a game that’s still being developed. But what’s so great about early access anyway? Why are hordes of people throwing their money at it? Here are some of the reasons why. Indie developers are called such because they’re not backed by a publisher; instead, they typically pay for expenses out of their own pocket. Even the more successful ones aren’t exactly flush with cash, and are nothing like the publisher-funded developers that employ hundreds and have larger budgets to work with. Without money, some indie games get cancelled, which is a shame because there are always several that brim with potential. By making their games available in early access programs, indie studios enjoy an influx of funds that let them continue development, and give you hope that the game you’re rooting for just might get finished. Unlike regular games development, which is usually an internal hush-hush affair, early access lets people play unfinished versions of a game. If they choose, participants then tell the developers what they think of the experience. This practice turns many into fans and make them more involved in the whole development process. Fan testers can be particularly helpful in development because they usually play the game more frequently and thoroughly; and report the bugs they encounter. This sort of engagement leads to a more active community behind the game, and ultimately helps the developers create a better product. Advertise their games on billboards and prime time TV. Hold press junkets to get the media hype rolling. Indie start-ups, however, aren’t so fortunate. Some can barely sustain their own development efforts! With early access programs, indie games get the publicity they need. Several are featured on the front page of prominent websites like The Humble Store and Steam, which millions of gamers see every day. And if the game is good enough, it would gradually generate more buzz, giving it an even wider audience who would line up to hand over their money. When you pledge money in a Kickstarter project or pre-order a game, you still have to wait until the product is released or the concept comes into fruition. But when you shell out for an early access game, you can start playing as soon as you finish downloading. Talk about (near) instant gratification! Like any bright spot, however, early access comes with its own share of problems. Here are some of the more significant ones. As mentioned earlier, early access games are unfinished, so it’s common for them to have missing features, incomplete levels, and major technical problems. Because of this, an early access game can create a poor first impression among its audience. Sure, the game is still in alpha or beta, which will probably help you be more understanding of its faults; others won’t be as forgiving though. There is a cost of admission to early access: the cheap games cost below $10, but there are also expensive ones that ask for $99.99. On average, early access games typically cost in the neighbourhood of $14.99 to $34.99. However, it’s not the price that’s troubling. It’s this: we’re paying for unfinished products and don’t seem to have any problem with it. Yes, early access games are still under development. Yes, “investing” in an early access game finances its development. Yes, bug fixes and features are expected to follow. And when the game is done, we don’t have to pay for the completed version anymore. The problem is that we don’t know if the quality of these upcoming features—or the finished game itself—will meet our expectations. We’re not even sure if there will be a finished product at all. Furthermore, many of these early access games are simply in no condition to charge money in their unplayable state, even if the fee is trivial. Granted, these issues aren’t exclusive to indie games under development, but it’s alarming to see that early access is being used as an excuse for shoddy work. You don’t know if the developer of an early access game you’re excited about will deliver on his or her promises or finish the product at all. There’s always a chance that the person could simply abandon the game after getting paid. How many times have you been hyped to try out an early access game because the trailer blew you away or the features listed by the developer seemed promising? Yes, you should take due diligence, but that doesn’t justify false advertising. Once you and legions of other consumers pay for early access to a game, there’s not much incentive for developers to continue adding features and fixing problems since they already have your money. Maybe that’s why there are early access games that hardly ever get updated. Since early access provides a built-in defence for poor quality, developers don’t have much incentive to make their game borderline playable/fun before making it available in early access. They might even rush the alpha to earn money right away, issues be damned. Anyway, people will still buy the game and be fine with it because it’s an alpha/beta. Ubisoft announced that Ghost Recon Online will soon be in Steam Early Access; so will H1Z1, Sony Online Entertainment’s zombie apocalypse MMO. It’s only a matter of time before other AAA publishers join the fray. There’s no rule barring them from participating, but let’s not forget that early access is supposed to fund indie developers. Game publishers are capable of financing their own development and have no business charging for an alpha or beta test. Admittedly, there’s no word if Ghost Recon Online will require a fee once it enters Steam Early Access, but H1Z1 certainly will. Here’s the thing: game publishers should actually be paying you to test their games, just like their own QA employees. 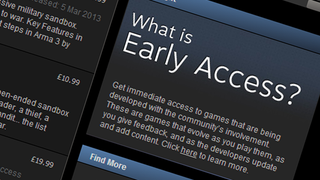 Once early access becomes more widely accepted, it could become the norm in PC gaming. Others may welcome this, but because early access is so easy to exploit, it could lower the bar in quality, make developers lazy, and protect similar games from criticism because they’re “unfinished”. Require developers to provide playable builds, communicate frequently to their community about the game’s progress, include a planned release schedule (not just a vague “TBA” or “When It’s Finished”), and actually finish their game. Prohibit all AAA publishers from charging a fee for their early access games. Remove games from their early access program if they don’t get updated regularly, unless the game is free. That way, developers still get their funding but are motivated to continue working on the game and deliver their promises. Be stricter with quality control. If the trailer or current features misrepresent the game being submitted into the program, then it should automatically get rejected. There are people who argue that if you spend for an early access game that turns out to be disappointing afterwards, then it’s your fault because you didn’t look into it extensively enough beforehand. It’s easy to say that people should research before spending, but this doesn’t always apply. It’s not the average consumer’s fault for not knowing what you know. Average consumers don’t read Kotaku or NeoGAF. They probably clicked “Purchase” because their friends recommended the game; you know, like how most people learned about Minecraft (i.e. through word of mouth). Lie about their game’s upcoming features. Not follow through on their promises. Things are looking up, though—at least on Valve’s end. In 2012, Valve took out The War Z from Steam after developer Hammerpoint Interactive lied about the zombie MMO’s features. Just recently, Valve also removed Earth: Year 2066 from its early access program because of its poor quality and deceptive marketing. As a cherry on top, people who bought Earth: Year 2066 were offered a refund. Take note, however, that Steam isn’t the only digital distribution service out there so there’s still plenty of work to be done to protect consumers. And while Valve has taken steps to keep developers honest, it could still do better. With tighter regulation, early access supporters won’t ever have to deal with scams since they’re pro-actively dealt with. This would also make developers more accountable and transparent about features and release dates. How can that ever be a bad thing? Of course, this doesn’t mean you shouldn’t read up on a product you want to buy. Hopefully, all this news about abandoned/removed early access games should serve as a warning to all of us to be more careful with our purchasing decisions. So what do you think about all this? Are you in favour of tighter control in early access programs, or would you rather keep things as it is? If so, why? I’d love to hear what you think! Console Gamer is a long-time Kotaku fan and aspiring evil genius. If you found this post interesting, you can visit Console Gamer’s website for more gaming-related stuff. You can also stalk follow Console Gamer at Twitter, Google+, and Facebook, if you wish.